Company History | Desmarais & Gagné inc. When it was first established in 1979, the company was primarily engaged in manual welding in the family garage located in Roxton-Pond, near the city of Granby, Quebec. The Desmarais brothers were quick to make their mark and build a solid reputation for the quality and integrity of their work. Being visionaries, the owners of the company have acquired the necessary equipment and tools required to automate their production and meet the growing and complex demands of their customers. They have always been on the lookout for new technologies and have always adhered to the highest quality standards. This is why the company is now accredited to CSA W47.1, CSA W47.2 and ISO 9001:2015. An expertise worthy of your projects! 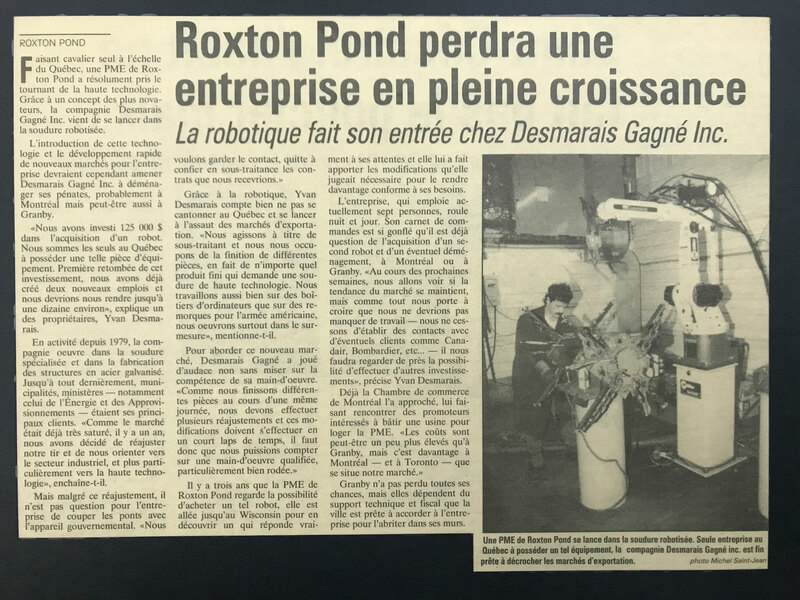 In 1993, the company acquired its first welding robot. Over the years, it has developed unparalleled expertise in robotic welding that has allowed it to become a pioneer in the industry. Shortly after, in 1996, Desmarais & Gagne Inc. turned an important page in its history by acquiring a 60,000-square-foot building in the heart of the industrial district in Granby, Quebec. A few years later, aware of the opportunities offered by these new premises and faced with a growing volume of business, the owners made the decision to make major investments in their equipment. The company acquired more than $ 3 million in state-of-the-art machinery for sheet metal processing and robotic welding. These acquisitions, coupled with the collaboration of several strategic partners, allowed it to fully execute complex and larger volume orders, from start to finish. These investments have proven to be worthwhile as they have earned the company several contracts with companies working in the aviation industry, recreational vehicles, medical, manufacturing, among others. The availability of its equipment and the expertise of its highly qualified workforce have enabled Desmarais & Gagne Inc. to found the Cab Expert division. It specializes in the design, engineering and construction of prefabricated and soundproof modular buildings. Subsequently, the DreamAircraft division was founded to build the TUNDRA, a plane sold as a kit. In addition, Desmarais and Gagne inc. created an aluminium hand-truck with accessories for all types of moves. Since that day, it’s the favorite in the distribution sector. All these developments have been made possible thanks to the extension of the expertise acquired by the company throughout its course. This company has built an enviable reputation in the market for four decades as a specialist in complete and turn-key solutions. It tirelessly continues its ascent towards a most promising future.